A walrus haulout on Round Island. These seven small, isolated islands in Bristol Bay host one of the largest annual land-based walrus haulouts in the Western Hemisphere. 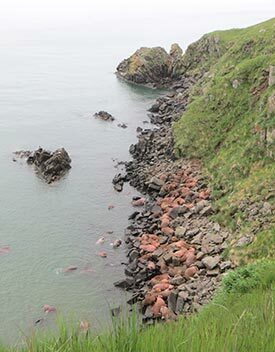 Each spring, 2,000 to 10,000 male walruses bask on the rocky beaches of Round Island for days at a time. Steller sea lions have a rookery nearby and gray whales swim offshore along the coast. In spring and summer, red foxes feed and play on the island slopes. 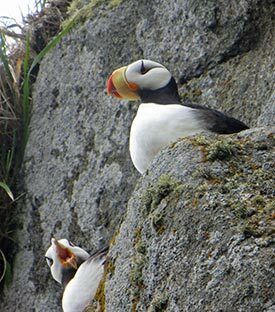 Hundreds of thousands of seabirds, including kittiwakes, murres, puffins, cormorants, parakeet auklets, and pigeon guillemots breed along the islands’ shores during the summer. Access and viewing is by permit only and is from May 1 to August 15. Five-day permits to camp on Round Island may be obtained on a first-come, first-served basis from the Alaska Department of Fish and Game (ADF&G) office in Dillingham. Visitors must be self-sufficient, in good physical condition, and prepared for inclement weather. For additional information visit the Walrus Islands State Game Sanctuary website. You can get to Dillingham and/or Togiak by commercial air service but you will need to make your own arrangements to get from there to Round Island. Access to the island can be accomplished via commercial or private vessels. ADF&G does not license or endorse any transporter and currently commercial operators specializing in transport to Round Island are limited. 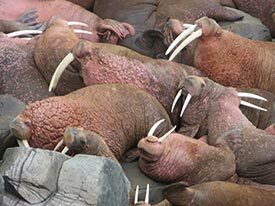 ADF&G (907) 267-2189 or visit the Walrus Islands State Game Sanctuary website.